After almost no riding in the first week of May, the second week was a standard full week commute. 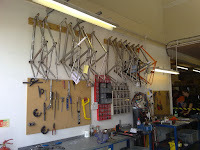 On Saturday 14th May it was the Enigma Bikes open day. 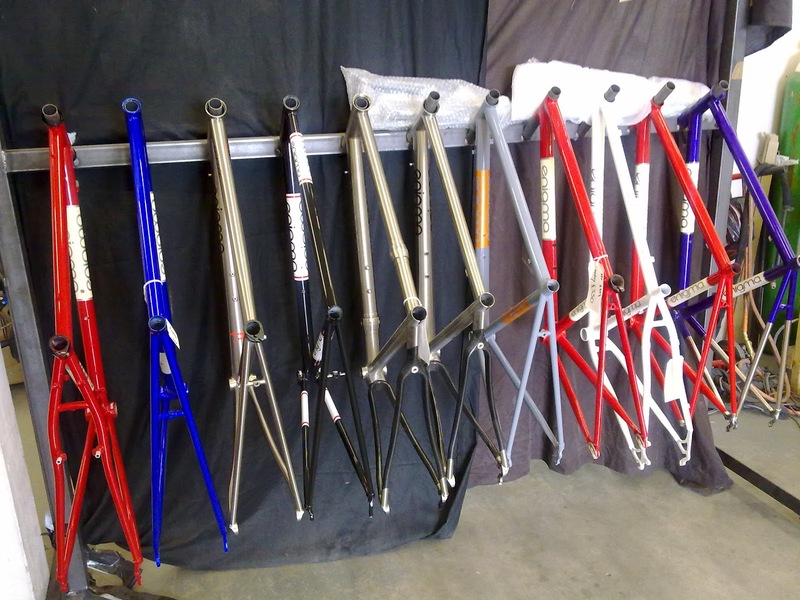 Enigma are a small company that hand build steel and titanium bikes to order. Enigma are based in an industrial estate in Westham near Pevensey and is just down the road from me. Although not in the market for a steel, titanium or custom bike I wanted to visit Enigma to see how these amazing bikes are made. I rode my new Rose bike the 1.6 miles to their facility and parked it outside. I went upstairs to their offices where there were a selection of their bikes on display. There was also a nice buffet :-). After lusting over the bikes for a while I went downstairs to the factory and started watching a frame building demonstration. 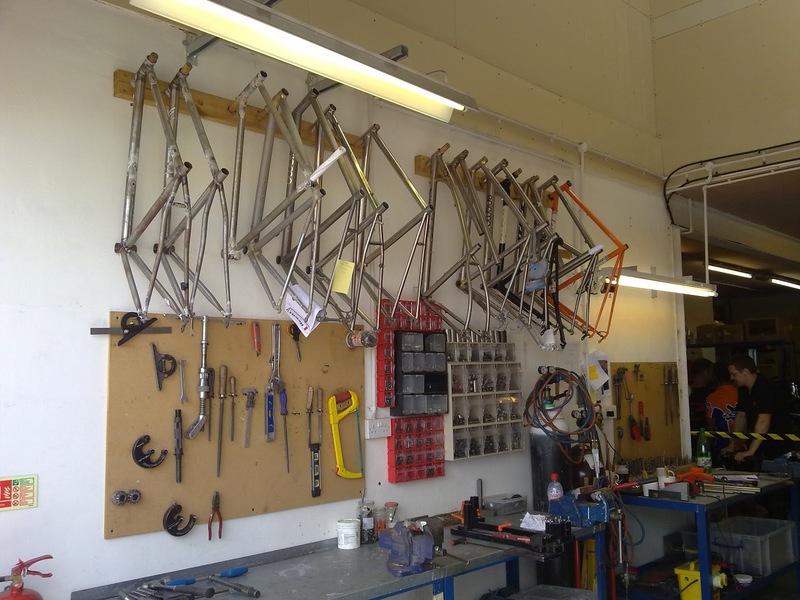 It's quite a painstaking process as each length of tube is meticulously measured and drilled to the exact specifications for the particular bike they are making. I watch closely as they were building a steel bike. 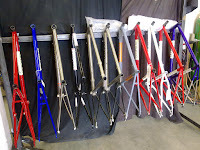 The tool they use are quite simple but they do have a special bicycle shaped rig they put the finished pieces into before welding or brazing. They had many frames on display that were for sale and seeing them up close makes you really appreciate the amount of work that goes into each frame. Although I didn't get to ride any of the bikes, they did say I could come back at any time and they would happily let me try out any of the bikes. If you in the market for one of these bikes, I suggest you give the guys a call as their workmanship is second to none. The third week of May saw yet again a standard full weeks commuting. 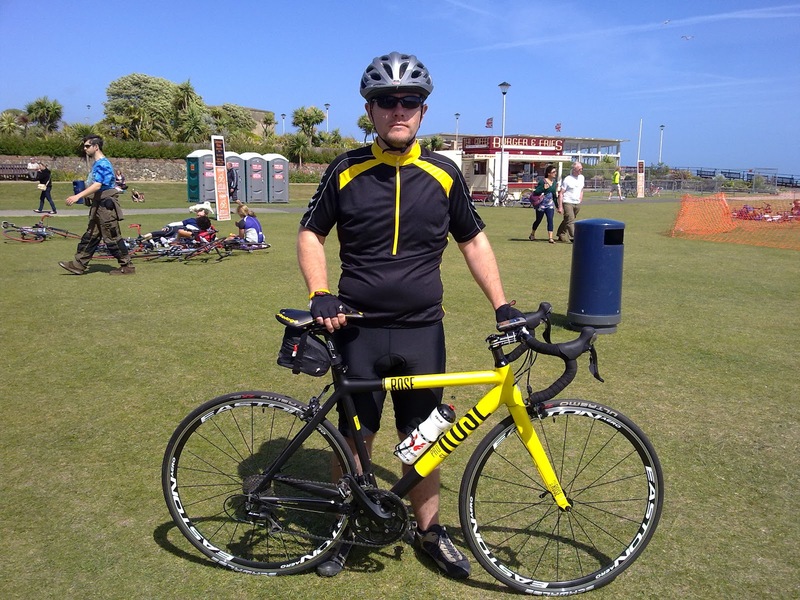 However, Saturday 21st to Sunday 22nd May was the first ever Eastbourne Cycling Festival. I'd hoped to take part in one of the organised sportives on the Sunday but as it was by Brother's wedding on the Saturday, I could only attend the festival on the Sunday. That meant that I'd have no time to see any of the Festival with my family if I took part in a sportive so I decided to get the ride a miss. 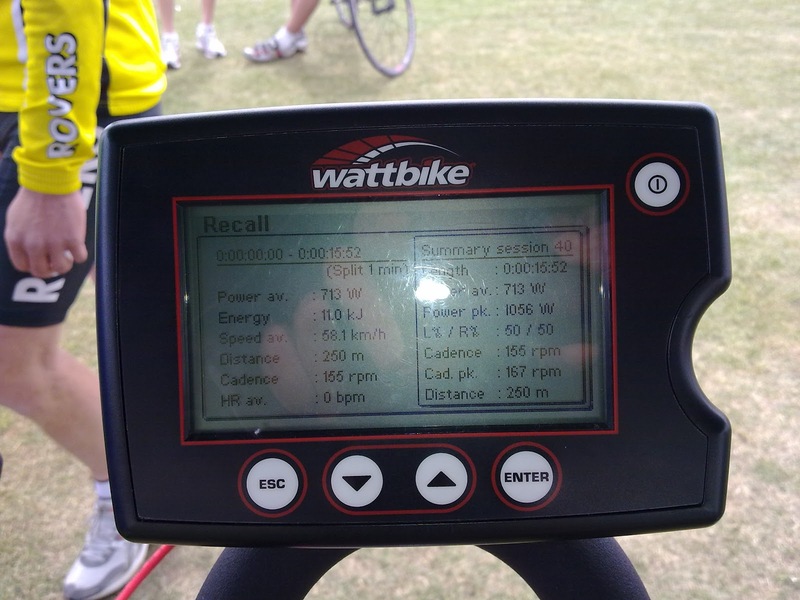 My Wattbike challenge results. Peak power 1056 watts! There was plenty of riding and racing at the festival, even though the festival village looked a little empty. The weather on the Sunday was horrendously windy. It was blowing a gale and didn't let up all day. I took part in the Wattbike challenge, a 250m sprint on a spinning style bike, pedalling as fast as you can. I managed 15.52s.I signed myself up for a mini time trial and at the same time signed my wife and kids up for a family ride. The time trial was 3 x 1 mile laps on closed road. The course featured an uphill section which was straight into the 30mph+ headwind. I managed a time of 10m32s. Full results here. There were a couple of bike retailers but with limited displays. There was a cycle skills course for children, a jump bike stunt display, some funky unicyclists and the local cycle club. All in all it was a good day but I was surprised there weren't more cycle retailers in attendance, not even the main sponsor had stand. I hope they do it again next year.